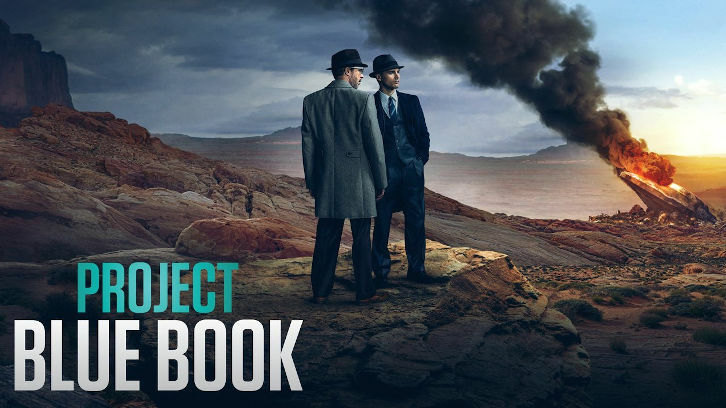 Project Blue Book “The Lubbock Lights” was written by Harley Peyton and was directed by Pete Travis, whose other credits include Fearless and movies such as Dredd and Endgame. Peyton’s other credits include Channel Zero, Dracula, and Twin Peaks, so both know effects and creepy conspiracy plots! This episode sees the tension ramping up on all sides, and the introduction of another historically based figure – Donald Kehoe (Adam Greydon Reid). 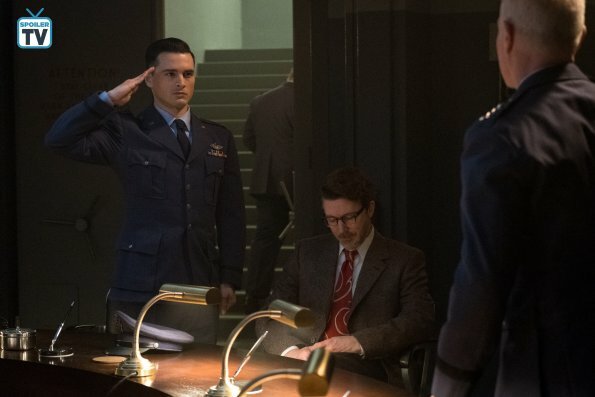 He was a pilot – like Quinn (Michael Malarkey) – but for the marine corp. He wrote for pulp magazines but was also widely recognized as a “ufologist” and wrote a book: Flying Saucers Are Real. Once again, the episode begins with the sighting. This time it begins in Lubbock, Texas, with Tom (Jesse Irving), an air traffic controller, on the phone to his girlfriend Gina (Francesca Bianchi). Suddenly, there’s an unidentified aircraft on the radar and then the power goes out everywhere. Lights flash by the tower, but Gina – and a bunch of other witnesses – also sees them. We then get Kehoe being interviewed and insisting that Aliens are real and there’s a massive government cover up. Hynek (Aidan Gillen) is listening on his radio. In the greenroom, Kehoe is accosted by a guy who Kehoe thinks wants an autograph, but it turns out Kehoe will give money for stories, and he wants to talk about Lubbock. As the two talk, a shady figure takes pictures from across the street. It’s a nice parallel back to Susie (Ksenia Solo) taking pictures of Mimi (Laura Mennell). It turns out Russia isn’t the only country spying on American citizens – America is doing it too! We discover later in the episode that Harding (Neal McDonough) and Valentine (Michael Harney) take a dim view of the panic that Kehoe’s stories generate. 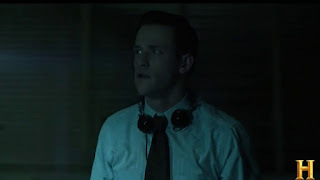 And we see this panic when Hynek and Mimi find Joel (Nicholas Holmes) asleep in his closet, hiding, after reading some of Kehoe’s “True Stories.” The two Generals have Kehoe picked up and have a gun shoved in his mouth to convince him that from now on, he will only write what they want him to write! We see that there is more tension within the administration over how to handle this though. Secretary of State Fairchild (Robert John Burke) shows up at the General’s headquarters and reads them the riot act. Kehoe is a former marine and a journalist! The government won’t tolerate “lawless enterprise” He threatens to tell President Truman “all” their secrets if they don’t dial it back. I really like the many layers to this show! Quinn and Hynek head to Lubbock to investigate. Tommy is now in a coma, ostensibly from a car crash, but there isn’t a mark on him. Gina is there and tells them that it makes no sense, especially if they saw his truck. As the two go to leave, Tommy seems to have a seizure and grabs Hynek’s hand. Hynek seems to have some kind of vision associated with this of Tommy in his truck. I have to say that this is one element of the show that I’m not liking a lot. 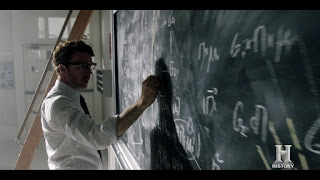 I prefer Hynek as a man of science and fact – not someone given to unexplained visions. The Sheriff (Peter Skagen) takes them to the truck and it’s basically been “wrinkled.” Hynek looks for a scientific reason for it – electricity maybe? And then the Sheriff tells them that there was another sighting and power outage the night before when they were traveling. This sends them off to the university, and we get to see a new side to Quinn. As the two walk through the campus to meet with the witnesses, Quinn is distracted by the co-eds and stops to flirt with one. Hynek views them as school girls, but Quinn points out that at their age he was fighting in the war – he’s entirely missed this kind of experience. But it is a nice scene to point out the differences between these two characters. When they get to the lecture hall, it’s packed with people. Again, we see very different sides to Hynek and Quinn. Quinn sees a bunch of kids who just want to get out of school – but university isn’t like that and Hynek knows it. 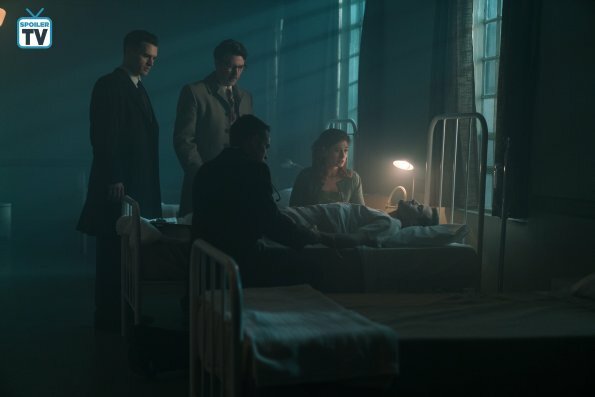 Rather than taking a harsh tone with the crowd as Quinn does, Hynek empathizes that it’s hard to come forward – remembering last week’s episode and what happened to Sara and her children. He tells them he appreciates them coming forward and asks how many saw the lights – all the hands go up, and they have their work cut out for them, listening to all of them. I loved the scene of Hynek madly tracking all the evidence on the blackboard while Quinn waits. Hynek determines that the lights can’t be shooting stars and there were no planes that night. Hynek is just about to say what he’s starting to think when Professor Fanshaw (Tony Alcantar) blusters in to kick them out of his lecture hall – and solve the mystery. He insists it’s plovers – birds – and the lights reflecting off their oily breasts as they fly in a V-formation. I loved the look on Hynek’s face – and almost died when he simply erased all that hard work! Hynek and Quinn go out to investigate and are walking up a residential street at night. 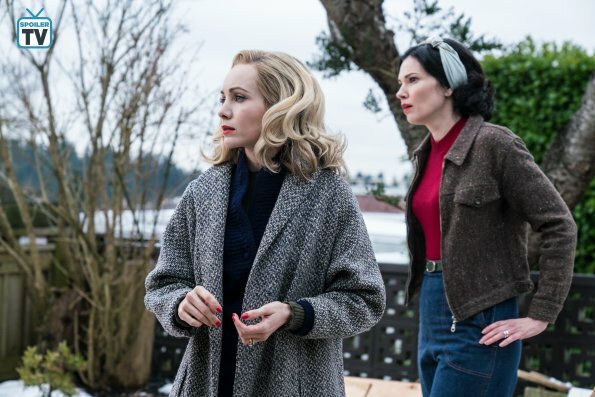 They comment on the unseasonable snow in Texas – a shortcoming to filming in Vancouver, which other shows have also had to deal with! Hynek is completely unconvinced it’s plovers, but Quinn tells him that their job is just to close the case and it doesn’t matter where the evidence comes from. When the co-eds drive by, Quinn stops to flirt with them a bit more, but it seems that Hynek’s words about them being school girls has made an impression. Quinn also muses about whether plovers would even be flying at night – most birds don’t after all. Meanwhile, the residents are tense and want to know who is wandering around their street taking pictures. Once again, their first reaction is violence in the face of a potential communist threat – a thread that runs through the homefront storyline too. 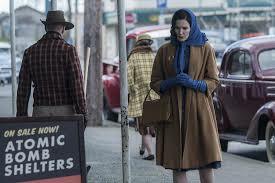 They want to see Quinn and Hynek’s id – and a quaint throwback to the period when Hynek says he doesn’t carry ID! Quinn steps in to protect Hynek when one of the men threatens him with a bat. Things disperse when the lights go out – and it seems the lights are coming back. Hynek and Quinn then drive out to a field. This is another great scene between these two. Hynek muses that there are 100 billion stars in the Milky Way – and each has a story to tell. 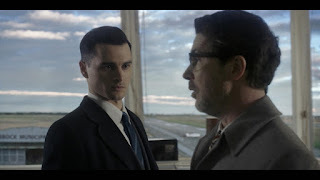 Quinn posits that Hynek likes stories – and recaps how they got there – Professor Dipstick’s theory, neighbors with pitchforks and a drive for nothing. Hynek says it sounds more like a wild goose chase (LOL – plovers!) than a story. Hynek then offers to drop Quinn at the dorm for the party. Quinn gets in the car and everything starts to go crazy. Quinn tells Hynek to stay away from the car, and then the lights show up. Quinn is able to get out of the car as soon as the lights pass – and there doesn’t seem to be the damage done to either Tommy or his truck. Quinn and Hynek then head to the air traffic tower. The radar data lines up with the blackouts and Quinn is suddenly not so sure of himself. 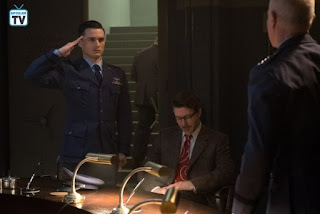 He wonders if maybe the Russians are testing something, but Hynek suggests that maybe it’s not the Russians – it seems he’s suggesting maybe it’s their own military testing something. 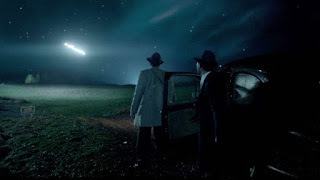 When Hynek and Quinn report that they have conclusive evidence of a UFO, Harding and Valentine bring them in. Harding tells them that it is, in fact, one of theirs out of Randolph Air Base – a super-secret V-wing plane. Hynek presses and wants to know about the power outages. Quinn avoids telling them about the car, and simply takes his orders with a snappy salute and a “keep it out of the public eye, roger that!” However, Quinn does shake his head when they leave and he tells Hynek that he’s the dumbest smart person that he’s ever met. Harding and Valentine have power that they can’t challenge. 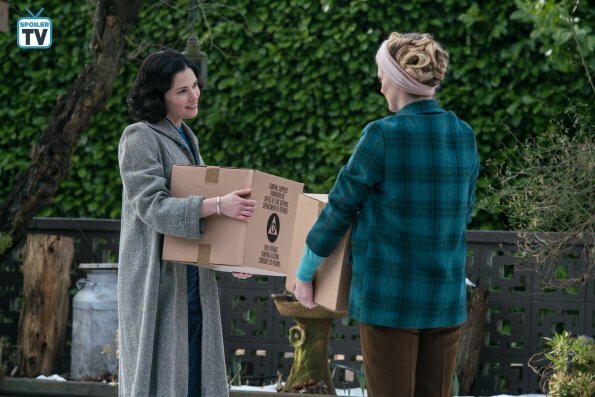 On the homefront, Mimi is out picking up toys when she goes over to help her neighbor, Donna (Heather Doerksen), who is stocking up her “bomb shelter” with supplies. Did anyone else find it hysterical that a plywood hut was supposed to help people in the event of nuclear war? As if that would be safer than your actual house? Donna, like the men in Texas, expresses concerns over the communist threat. She also makes sure to impress on Mimi that there is only room for ONE family in the shelter – and her husband has bought a gun to keep anyone else out! Given the problems that Joel has been having with anxiety, Mimi goes to the hardware store to investigate getting a bomb shelter for them. I loved the way the salesclerk (Gaalen Engen) tries to brush her off and tells her to bring her hubby in and she just gives it right back to him. This wifey will be buying and building the bomb shelter herself! However, it’s also while in the hardware store that Mimi first notices the mysterious man following her. Mimi is looking over the plans to the shelter when she hears someone at the door. She grabs the fire poker and answers the door about to clobber them! It’s Susie, there to apologize – but why didn’t she just knock? Mimi tells her that she doesn’t need to apologize – and it’s another bit of nice subtext that Susie wants to know if it’s something she did – like come on to Mimi, maybe? Mimi completely misses it, however, and just brushes it all off as her realizing that with Hynek at the university, she shouldn’t be seen in a place like that. 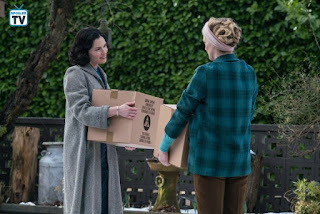 We also get another nice scene between Mimi and Susie as she helps to build the shelter. She tells Mimi that her father taught her how to build things. It’s interesting to wonder how much truth she’s including in her cover. The two also see the man watching. He disappears when the two go after him. When Hynek gets home, he finds all new locks on the doors. When Mimi tells him someone’s been following her, he immediately asks if he was wearing a fedora and a trench coat – which only scares her more! Hynek assures her that she doesn’t need to worry – Hell, yeah, she does! – and Mimi insists that he’s gone all the time. Joel overhears – just what he didn’t need to hear. He’s excited to show off the bomb shelter, however, and it’s clear that he does get some comfort from it. I really liked how this episode developed the relationship between Hynek and Quinn and deepened the layers of mystery around these issues. A quick shout out to guest star Steven Williams as Nate, Harding’s chess buddy. I’m hoping we are going to see more of him in future episodes. What did you think of the episode? Is this proof of UFOs? Do you believe the government explanation? Let me know your thoughts in the comments below!